Home > Guides > Employer Guides > Annual Leave and Other Leave > Public Holidays. Employers across New Zealand are required to recognise the 11 public holidays provided for in the Holidays Act 2003. These 11 days every year can cause confusion for employers when it comes to public holiday pay. The most important message for owners of any business is that regardless of the type of employment, whether it is full-time, part time, or casual, your employees are entitled to any benefits that come from working on public holidays. When a public holiday falls on a day an employee would typically work, they are entitled to a day off. However, an employee can be made to work if the public holiday is observed on a day the employee would typically work and their employment agreement says they have to work on the public holiday. If the employee is made to work there is a public holiday rate of pay which is time and a half and the employee will also get another paid day off later, otherwise known as a day in lieu. If an employee works a public holiday which is not a usual day they would work, the employee is entitled to time and a half. There is an added dimension to working on public holidays which can be best illustrated in the case of Easter and when employees work over this period. The public holidays for Easter are Good Friday and Easter Monday, meaning normal public holiday entitlements apply. However, if an employee works on Good Friday but does not normally work on Friday, they are entitled to be paid time and a half but will not get a paid day off later. Easter Sunday is different again as it is not a public holiday itself, so if your employee works they are entitled to the usual rate of pay. If the employee does not work on Easter Sunday they are not entitled to a paid day, unless the employment agreement stipulates something else. Public holidays on a weekend. 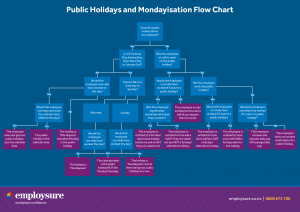 Where public holidays are attached to specific dates, rather than days like the Queen’s birthday which is always on a Monday, there can be confusion about the correct way to observe the public holiday, especially when it comes to determining things like public holiday pay with public holidays on a Saturday or Sunday. Observing a public holiday on a Monday occurs only when the employee does not work on the calendar date of the holiday. In other words, if an employee would ordinarily work on the actual day of the public holiday, whether a Saturday or Sunday, then there is no Mondayisation for this employee and the public holiday benefits only apply to the actual date. Ultimately, an employee will not get two public holidays for the same occasion. Click the image below to open our flowchart on how to calculate Mondayisation, or you can download the flowchart here. An important scenario can often present itself where a public holiday falls during a period of leave for an employee. In this scenario, both the type of leave and the type of holiday need to be taken into account. During a business close-down period that includes public holidays, which is often the case over the Christmas and New Year period, employees are entitled to a paid public holiday only if they would ordinarily work on the day of the public holiday. This is also the case in instances of annual leave, as employees are only entitled to public holiday pay if they would normally work on the day of the public holiday, meaning they will not lose a day of annual leave. However, where a public holiday falls and an employee is on parental leave they will not be entitled to public holiday pay as they would not have normally worked that day. Also, when on parental leave the payment amount and the number of weeks of leave are not impacted by a public holiday falling within this leave period. In the case of sick or bereavement leave, if an employee would have worked had they not been on leave, the day is considered a paid unworked public holiday. In which case the employee is paid a standard daily rate of pay and is not entitled to an alternative holiday, but no sick or bereavement leave is deducted either. If an alternative day cannot be found the employer is entitled to choose a day, provided it is reasonable, and give the employee 14 days’ notice. Also, provided no employment agreement is in place with any other stipulation around payment of alternative holidays, an employee is paid their relevant daily pay for the day taken as an alternative holiday. An employee who ceases employment, or whose employment is terminated, is entitled to be paid out any alternative days they have not utilised by the time they conclude their employment. Alternative holidays can also be paid out if the employee doesn’t take the day within 12 months of it being earned. In this instance the payment must be agreed by both the employer and the employee and the payment is to be made as soon as practicable after the agreement has been finalised. Dates for public holidays in New Zealand. For peace of mind around managing your employees on public holidays call 0800 675 700 day or night for advice and support.